As a father, one of my nightmare scenarios is being unemployed. Why? Well, I can actually tell myself I’m better off than most people but if I become unemployed, then that means I’m a lot more toast than them. Another reason why it is so scary is because it is so real and has a higher likelihood of happening compared to other challenges. When I was younger and unattached, being unemployed simply means crashing in to my folk’s place and being friendly with the couch, but things are very different now that I have my kids. I can’t stress this enough. Debt is one of the nastiest things that can bite you on your hind side no matter if you have work or is facing unemployment, but the bite is much worse when you have no source of income. When you are in debt and can’t pay, everything you have can be taken from you. Spend within your means and don’t forget to save for a rainy day. Buy with cash so you don’t forget how much you’re spending and keep that credit card under lock and key if you can. Speaking of saving for a rainy day, make sure you have a separate emergency fund. In case the washer needs to be replaced, your car tumbling down a cliff (without you) and other scenarios, it is always good to have some extra funds you can dip into. If you’re single, about 6 months worth of living expenses would be good to have under our emergency fund and if you have children or other people who depend on you, then at least a year’s worth of expenses stowed away in a bank account would be ideal. This is plain common sense. Even if you are not preparing for being unemployed, having some extra food in the house is a basic survival strategy. In case of natural disaster and other SHTF scenario, you would need a few week’s supply anyway so just think of this as a bit more than that. The usual 6-12 ratio applies here. If you’re single, then 6 months worth of food is fine and if you have multiple mouths to feed, then 12 months worth of meals in the form of freeze dried and long term food would be great. This allows you to save your cash for utilities and other daily expenses until you get other sources of income. 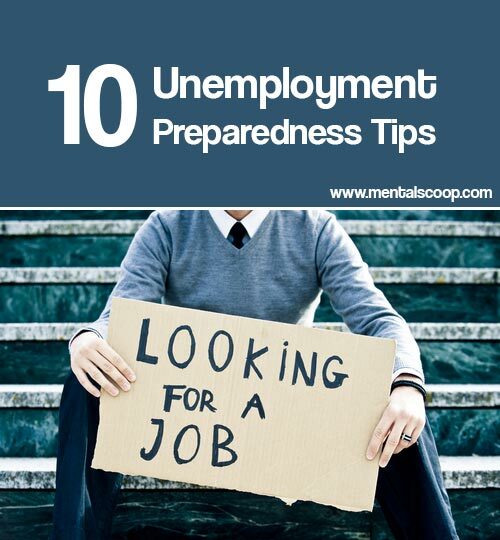 Don’t wait until you get unemployed to look for a job! Always keep an eye out for better work opportunities as well as networking opportunities. You may want to clean up your Facebook and build up your LinkedIn to be more professionally attractive. You might be surprised at how jobs would come looking for you and not the other way around.